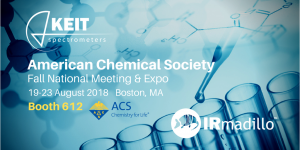 We’ll be exhibiting and speaking at The American Chemical Society’s (ACS) Fall National Meeting 2018 (19-23 August) in Boston, Massachusetts (Booth #612) — You’ll see us demonstrating our compact, online mid-infrared spectrometer at one of the largest national meetings in the US focused on chemistry and the innovations in its applications. Right at our booth we’ll show how easily our real-time process analyser works to monitor chemical reactions – from differentiation of multiple sugars, to determining alcohol and acid concentrations in a complex processes. Pick up a small gift as a thank you, and get to talk about the new model of Steamy IRmadillo, an FTIR model customised for use in industrial environments that require sterilise-in-place (SIP) procedures. Our own Dr. Jonathon Speed and Dan Wood will be presenting throughout the entire meeting. Make sure you attend one of their presentations. Can’t Make it to ACS Fall 2018? There are lots of opportunities to connect with us around the globe. Click on our Events tab for an updated list of all the places we’ll be. Or, follow our updates by connecting with us on LinkedIn, and Twitter.